On the runway to more fuel-efficient aircraft, one alternative propulsion scheme being explored is an array of electrically powered ducted fans. The fans are distributed across the wing span or integrated into the wing. Researchers at the University of Illinois gained new understanding in how the fans and especially their precise placement on the aircraft can affect the cross-conversation between propulsion and the airflow around the wing. In most commercial aircraft, the engines are isolated from the rest of the wing system. Instead of being embedded in the wing or mounted more closely to that surface, they hang out from underneath the wings. This is done, in part, to try to reduce the influence in cross coupling—the cross-communication between the engine’s RPM and the airflow characteristics about the airplane wing. Ansell, along with his graduate student Aaron Perry at U of I and Michael Kerho from the Rolling Hills Research Corporation conducted the study to understand on a basic level what those interactions are and how that coupling between ducted fan systems and wing sections will modify the aerodynamic behavior and the overall lift, drag, and pitching moment characteristics. 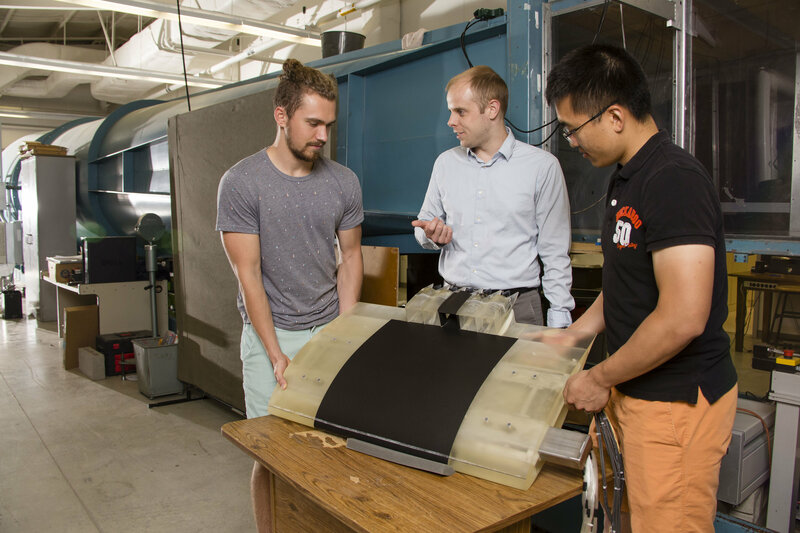 This research project was conducted experimentally using a 3-D printed model of an airfoil, which is a cross-section of a wing, mounted inside a subsonic wind tunnel. “We had a model with ducted fans mounted over the trailing edge of the airfoil. The flow goes across the upper surface and then into the fan,” Ansell said. He said that the manipulation of the throttle of the ducted fan mounted on top of the wing provided large changes in the aerodynamic behavior of the airfoil. Ansell said the study provides a new way to understand the dialogue between a full aircraft system and a propulsion system. It’s not just about increasing the throttle to create a larger thrust and produce a force that goes through the axis of the orientation of the fan. “It’s not that simple because it also changes the air flow over the wing,” Ansell said. “The different orientations of the end of the fan changes the performance of the wing section as well as the pressure distribution because it changes the local flow quality characteristics. We have now quantified that and can understand some aspects of what that looks like. The paper, “Aero-Propulsive and Propulsor Cross-Coupling Effects on a Distributed Propulsion System,” was written by Aaron Perry and Phillip Ansell. It appears in the Journal of Aircraft.